As one of the select favourites to win the Russia 2018 World Cup, Brazil’s first game saw them as clear favourites as they faced Switzerland, a nation that hadn’t progressed beyond a last 16 place at a World Cup since 1954. But the Swiss had lost only 1 of their last 23 games, to European champions Portugal and it was the expectation of many pundits and punters alike that this matchup may signal the return of Brazil’s ‘Joga Bonito’ (beautiful game) up against a tried and tested international defence. 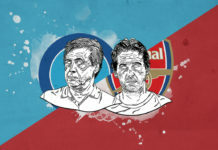 The term ‘unstoppable force meets immovable object’ comes to mind. 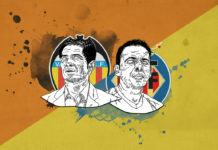 Brazil’s 4-3-3 is set up to give attacking licence to their many creative talents while Real Madrid’s Casemiro would sit deep and protect his back 4 while covering for the side’s attack-minded full-backs when they push high. 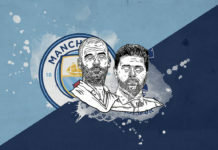 Brazil manager Tite hopes Gabriel Jesus’s work rate in leading the press and his dynamic runs to stretch opponents will unsettle even the most organised defence. Vladimir Petkovic’s Switzerland have lost only once in regular time in their last 23 games and their typical 4-2-3-1 is very well disciplined and tactically astute. Behrami and Xhaka shield the back 4 and the full-backs rarely get caught high up the pitch. Seferovic is a bit of an old-fashioned centre-forward tasked with making the ball stick up front while Switzerland’s main creative threat comes from wide-right in the shape of Xherdan Shaqiri. With Marcelo at left-back, Neymar on the left-wing and Coutinho at left-attacking-midfield Brazil understandably favoured their left flank when initiating attacks, particularly in the first half. 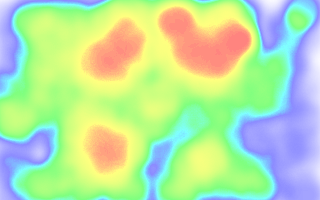 Their heat map indicates a huge favouritism of the left wing from Brazil, most likely because Neymar is the focal point of Tite’s side and with Coutinho and Marcelo, can create triangles to open up gaps in the opposition block. This made for a rather asymmetric look to Brazil’s formation with Marcelo high and wide on the left wing, Willian giving the same width on the right while Neymar moved inside and floated into pockets of space and Danilo moved slightly into midfield from right-back. Brazil got some joy from their width as it gave them a chance to get their superb dribblers in 1v1 situations, isolating Swiss full-backs. Paulinho would get forward from midfield and almost play as a second striker, backing up Gabriel Jesus as a presence in the penalty area and in the 11th minute it almost resulted in a goal for Brazil. 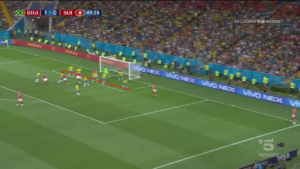 As is common with teams who like to maintain possession, Brazil tried to pin Switzerland back in their own third by getting first to clearances – positioning Danilo centrally when Marcelo went wide left and also having Thiago Silva push into the Swiss half, leaving Miranda as the furthest defender back. This was an attempt to keep the ball in the oppositions half so as to create relentless waves of attack but Brazil found it difficult to sustain and often ended up retreating after losing possession. 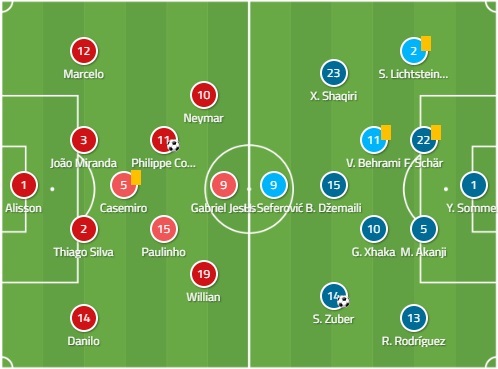 As Brazil continued to be patient in their build-up, the likes of Neymar and Coutinho would drop deep in search of possession, looking for time on the ball and allowing the Swiss to drop deeper. 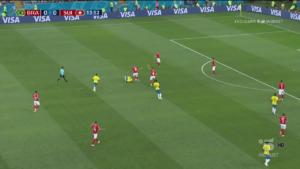 Gabriel Jesus was the only player consistently trying to stretch the play and take advantage of spaces in behind but his teammates barely seemed to notice, choosing the safe pass in front of the Switzerland block instead. When you have a player of the quality and stature of Neymar, you play him. This Brazil side is a built around the world’s most expensive footballer and there is little question as to why – on his day Neymar is one of the very best on the globe. The PSG man is seemingly even given special license preserve his energy and not commit to team shape when his side are out of possession despite the space this leaves in front of Marcelo on Brazil’s left. Neymar won only 1 tackle and didn’t make a single interception all game. In this free role though you have to produce the goods when in possession, typically not an issue for Neymar, but seemingly still not 100% Neymar struggled for the first hour at least to impose himself on the game, only creating 1 chance from open play – a fantastic ball over the top of the Swiss defence which Coutinho couldn’t finish. He was dispossessed 7 times throughout the game with Valon Behrami in particular quite aggressive in tackling Neymar. Tite will no doubt believe that getting Neymar the minutes he needs to shake off the cobwebs instead of taking him off will be beneficial for Brazil in the latter stages of the tournament. But playing through a man who is not at his best doesn’t often bear fruit and Tite would be forgiven for thinking Roberto Firminho or perhaps Douglas Costa might have made a more positive difference to Brazil’s attack instead. 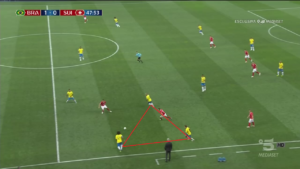 Setup in a narrow 4-2-3-1, Switzerland’s attacking midfielders typically set up at least 10 yards inside the Brazil half when the South Americans routinely tried to play out from the back. Holding midfielders Behrami and Xhaka would aggressively press behind Coutinho and Paulinho when either dropped deep to receive the ball which left very little space in the middle of the pitch for the Brazilians to play through. When possession was theirs, Switzerland did not often try to initiate fast counter attacks nor did they often launch it up to Seferovic to hold up. Instead, they looked to keep possession, allowing the Brazilians to fall back behind the ball and away from the Swiss net. 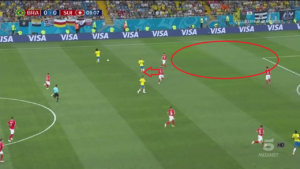 At first, the lack of a creative playmaker, particularly at #10, looked as though it might undermine the Swiss game-plan but keeping possession seems in hindsight a defensive tactic rather than an offensive one, forcing Brazil back behind the ball before looking for any gaps. 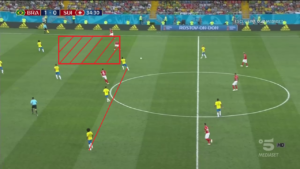 Often central to this was again Valon Behrami who would drop deep to receive from the centre-backs before trying to pick gaps in the Brazil block. The opening goal which came in the 20th minute resulted from the Swiss players paying a little too much attention to Neymar which left a certain Phillipe Coutinho free on the edge of the box, a dangerous situation. Neymar drove through the Swiss midfield before finding Marcelo in that wide left area once again, Marcelo’s cross was cleared but only as far as Coutinho and the Barca man bent a stunner inside the far right post of the goal. Switzerland didn’t let the goal unsettle their game-plan though and saw out the first half with little further goal-mouth incident. The break gave the Swiss a bit of confidence and within only 5 minutes of the restart, they had their equaliser. Brazil’s primarily zonal marking on corners left a lot of space to attack for Switzerland’s big men and Zuber posted up behind Miranda and won the physical battle (perhaps controversially) with the Internazionale centre-back, leaping high in the air to head home the leveller. 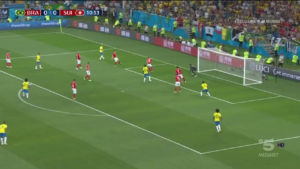 The goal was like a volt of electricity through the Swiss team’s confidence as they began pressing the Brazilian’s higher in attempt to take advantage of the shock the goal had caused. 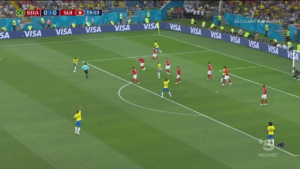 But Brazil continued to look the more dangerous and the last 10 minutes saw Switzerland pushed right back into their own third by Brazil’s pressure, mostly threatening from set-pieces as the Swiss players resorted to tactical fouling to stop flowing waves of attack. Brazil created chances with their set-piece delivery but a combination of poor shooting and Jan Sommer kept Tite’s men at bay. It may go without saying that Switzerland will be the happier of the two sides with this result but from a tactical standpoint, Vladimir Petkovic out-performed Tite as the Swiss executed their game-plan almost to perfection. Die Nati’s aggressive mid-block was rarely troubled by Brazil and it made the play predictable. If Switzerland can do this to the attacking talents of Brazil they should be confident of making life very difficult for any side and should take a lot of confidence from their performance. Negatives from the game for Petkovic’s men would stem from the lack of a creative midfield player to utilise their 45% possession more effectively while also failing to manoeuvre Xherdan Shaqiri into more 1v1 situations out wide would have to be a source of regret. 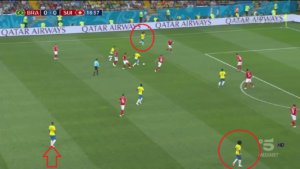 Brazil, on the other hand, seemed caught in two minds, wanting to maintain possession to get the likes of Coutinho and Neymar on the ball yet not pressing high up the pitch frequently enough to keep play in the Swiss half and force them long where they lack pace in behind. 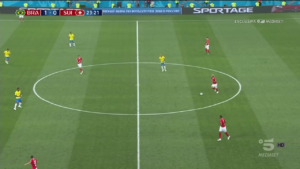 This meant the Brazil players were too often dropping deep in search of the ball instead of stretching play in behind meaning Switzerland’s defenders were rarely running back towards their own net and saw most of the game played in front of them. Then upon regaining possession Switzerland were mostly faced up against a fairly passive Brazilian medium-block. Brazil may need to either change the way they press or become a little more direct in their passing when they meet Costa Rica on Friday. What Else Can We Expect From Sarri’s Chelsea?